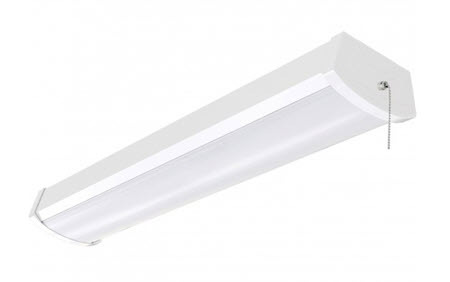 LED ceiling wrap light with 20 watts will produce a pleasing, bright light for many types of surface or task lighting. It has 2 foot length, a long life with great energy savings and comes with a pull chain. It's become a good way to create a clean look that delivers maximum light output. You can use these in kitchens, laundry rooms, utility areas and for general lighting in commercial buildings. This is the perfect kind of light for an interior bench or work area. It gives you all the light you will really need compared to something like a fluorescent fixture that you could be replacing. This particular light doesn’t have any bulbs, but simply an integrated LED system. You won’t ever have to change a light bulb ever again with this, just enjoy reliable service over many years with this simple work light. It has a bright white light output that is activated by pulling on a simple chain and has an attached plug-in cord. For those of you who want the efficiency of LED lighting that you can put almost anywhere, this LED ceiling light will fulfill that need and comes with a convenient pull chain. It provides a high-quality light that’s going to allow you to be able to see things very well, even fine work that you might be doing underneath. This can bring greater productivity to people in any kind of a workshop surrounding. By getting a light that gets down where you need it you save energy and you bring a correct quality of light for people. It’s energy-efficient because it uses just LEDs and it’s only 20 watts so you’re going to be able to replace a couple of fluorescent light bulbs. These have a color temperature of 3000K which is like a cool white color that most people are used to in a commercial office lighting environment. People really like that color of light and it does very well with a contrast between black and white making it a good light to read under and increased visual acuity. These are specifically designed as a strip light and they can be hung from almost any situation. As can be used in a lot of different places, not necessarily a workbench, anywhere that you need a lot of light that is quickly accessed by simply pulling a chain. It’s a form of an LED utility light for just about anything including things like laundry rooms, warehousing areas or closets to name a few. The sleek design is brought about by having LEDs being the center of how the light is constructed. This is likely one of the nicest things that have happened to light fixtures over the past several years is that LED is changing the way the forms look and they tend to be less obtrusive. It’s good to have something that isn’t so bulky or thick and stays out of the way of whatever task you’re using it on. Saving cash always feels good. There’s never been a better time to switch to LED lighting with all the other incentives that are out there, but this also has a 50,000 hour rated life so you’re not going to be replacing it for very long time. And the way folks use LED shop lights is typically something that’s periodic, using it now and again and not necessarily 24 hours a day. For those of you who have a commercial operation or a manufacturing facility that might be a different story. You’re going to get a lot more energy savings and very fast paybacks on this particular light fixture. If you want to know how much you’re going to save by going to this type of light fixture replacing old fluorescents, we have an Excel energy calculation spreadsheet on the left-hand column of our website. All you have to do is input your existing lighting and the wattage it draws and put in this light fixture’s data and it will calculate how much you can save in real dollars. It’s not an intensive audit or detail of every factor, but it probably covers 95 percent of what you may need to know in order to reduce energy waste and know how much that is. It will even calculate the payback that you’ll get in months or years depending on how much you use the light. Keep in mind that there are electric utility rebates out there that will reduce payback and increase your ROI. It’s something to be aware of if you’re going to do a larger scale type of change replacing many fluorescent shop lights to this LED light. There’s never been a better time to switch over to LED, the incentives are great and the cost of the product is come down significantly over time. While he does come down and cost, it’s also gone up in performance in light output and then also in the quality of light. One of the things we specialize in is a quality light fixture, not like the bargain stuff that you might buy at a big box supply. This is made from high-quality materials and it is considered a specification grade. So it’s going to have a better design, smoother edges and a performance that emphasizes a commercial grade product. So for those of you who have commercial buildings or a manufacturing facility, you can buy with confidence from us knowing that this light fixture's going to meet those kinds of specifications. This product is made from the prime LEDs and components that will give you performance for many years in the future. It even has a five-year warranty which is going to cover you in case of any early failure. If you have a problem in that timeframe, the manufacturer will stand behind it and we can facilitate that for you. So you’re covered for a very high-grade light fixture at a equitable cost. If you’re looking for a larger quantity of these for manufacturing or facility, please let us know by dropping us an email or calling and we can give you quantity pricing. We want to give you the best possible pricing we can right away so you can know how to bid out your project. And nothing would make us more happy that you have a profitable lighting project making your company and employees more productive. If you are a home user and you’re going to use this over an area of some kind, know that you’re getting something much better than what you’re used to from a retail store. It’s perfect for that type of application as well, you don’t have to have a big facility or some kind of big operation, will take care of you just fine. We believe that everybody should have excellent lighting for their workspaces and that this LED wraparound light fixture should serve you very well.